Dosbat: Cold Winters: Low solar activity. In Shindell et al the authors examine a possible mechanism for the Little Ice Age and cold winters in the Northern Hemisphere. There seems little doubt that there were cold periods around the world, although differences in timing of cold periods around the world suggests a complex process. Shindell et al discusses the cooling effect of reduced insolation around the tropics, and this is key to the mechanism that plays out in their model simulation. However there also seems little doubt that the cooling was most pronounced in the Northern Hemisphere, notably Europe. Anyone familiar with European winter weather could reasonably suggest a link with the Arctic Oscillation. Shindell et al state the mechanism they identify in the model as leading to cold winters in Europe. Reduced irradiance during the Maunder Minimum causes a shift toward the low index AO/NAO state via this same mechanism. 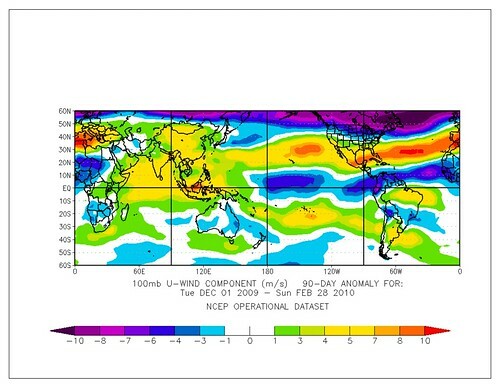 During December to February, the surface in the tropics and subtropics cools by 0.4° to 0.5°C because of reduced incoming radiation and the upper stratospheric ozone increase. Cooling in the tropical and subtropical upper troposphere is even more pronounced (~0.8°C) because of cloud feedbacks, including an ~0.5% decrease in high cloud cover induced by ozone through surface effects.. ..This cooling substantially reduces the latitudinal temperature gradient in the tropopause region, decreasing the zonal wind there at ~40°N. Planetary waves coming up from the surface at mid-latitudes, which are especially abundant during winter, are then deflected toward the equator less than before instead propagating up into the stratosphere. This increases the wavedriven stratospheric residual circulation, which warms the polar lower stratosphere (up to 1°C), providing a positive feedback by further weakening the latitudinal temperature gradient. The wave propagation changes imply a reduction in northward angular momentum transport, hence a slowing down of the middle- and high-latitude westerlies and a shift toward the low AO/NAO index. So is this pattern apparent? It is complex to answer that, and further complicated by the fact that whatever may be happening now is happening against a background of global warming driven by human activity with associated cooling above the mid stratosphere and above due to the enhanced greenhouse effect, so temperature indices are not likely to be a good start. But from my reading the decrease in zonal wind at about 40°N is a key link in the chain outlined by Shindell et al and, if this solar mechanism is in play, the decrease in zonal wind should be apparent in the winter atmosphere of the last two winters. From the above NCEP/NCAR plots of tropopause zonal wind component it is apparent that the suggested pattern, a reduction in zonal wind around 40°N, is not manifest. In 2009/10 there is a substantial increase south of that lattitude, and decrease to the north. In 2010/11 the pattern is more complex but still it is hard to argue that the sought pattern is manifest. However there are other mechanisms by which solar activity could impact the occurrence of low AO events, consequent blocking events and cold winter weather. Most notable is the effect of solar UV, during solar cycles total irradiance changes are only around 0.1%, however UV irradiance can change by several percent. In a comprehensive 2003 review paper Baldwin and Dunkerton argue (convincingly in my opinion) that changes in the stratosphere, due to changes of production of ozone, impact the atmosphere in the tropical troposphere, and hence weather. Stratospheric ozone is produced by UV, the UV splits oxygen (O2) to leave two highly energetic oxygen atoms, these atoms can then bind with more O2 to give O3 (ozone). As UV insolation increases more O3 is generated, this is then able to absorb more radiation and hence warms the atmosphere. This acts to amplify the initial stratospheric warming caused by the insolation increased, so it's a positive feedback. Conversely, as UV decreases during a solar minimum less ozone is produced, which intercepts less UV and cools the stratosphere - amplifying the cooling. These processes cause a temperature change of around 1K during the solar cycle. However In Shindell et al they state that reduced irradiance during the Maunder Minimum causes an increase in upper stratospheric ozone, a statement that is at odds with the other papers I've read and doesn't tally with my understanding. I will post in the comments if I can clarify this point. With regards the UV impact, there are two suggested processes. In both cases reduced UV insolation cools the tropical stratosphere, the direct effect is then an impact on the Hadley circulation, which may impact circulation outside the tropics. There is also an indirect effect: The cooling (warming) of the stratosphere during periods of low (high) solar activity affect the behaviour of waves in the atmosphere. The atmospheric waves in question are Rossby waves. A specific case of Rossby waves in the atmosphere is illustrated by looking at the polar jetstream. Jetstream analysis, from San Francisco State University, California Regional Weather Server. The polar jetstream is an outcome of the boundary between warmer sub-tropical air and colder polar air. Where the two masses meet their interaction is modified by the spin of the earth (coriolis effect) and a fast flowing band of air appears in the upper troposphere moving eastward, this is the jetstream. Just as waves on water are not the water, but are movement of energy along the surface of the water, with gravity as the 'restoring force' i.e. trying to push the water down to a steady level. So it is with the Rossby waves on the jetstream where the restoring force is the latitudinal variation in Coriolis force. 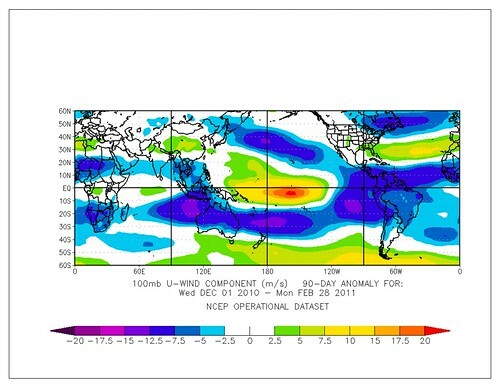 As opposed to waves in the ocean, Rossby waves in the Jetstream are horizontal. On the above plot you'll see grey bands circling the pole, these are the jetstream winds. But these bands are kinked, watch a timeseries and you'll see these kinks move around the jetstream, they're Rossby waves travelling along the jetstream. Note that this is best seen in winter, when the pole is coldest. Rossby waves that enter the stratosphere break within the stratosphere or mesosphere, creating long-lived fluctuations in the strength of the winds that form the stratospheric polar vortex. The stratosphere organizes chaotic wave forcing from below to create variations in the strength of the polar vortex, which can last a month or two. Changes in the strength of the polar vortex then feed back to affect weather and climate in the troposphere. Barriopedro et al find that whilst the frequency of blocking events in Europe is not increased by reduced solar activity during solar cycles, the centres of action are moved to to the east. They suggest that this may explain the cold winters experienced by Europe during the Maunder Minimum. This also applies to the recent cold winters in Europe, certainly from my point of view in the UK, what caused the severity of 2009/10 and December 2010 wasn't just the high pressure and its persistence but the eastward centre, which meant that instead of being under the centre of the high we were subjected to northerly and easterly winds bringing us repeated snowfall and unusually cold air. Lockwood et al examine a possible link between cold winters in Europe and low solar activity. Using the Central England Temperature series, which goes back to 1659 (the start of the Little Ice Age), they examine the correlation between cold winters and solar activity using the open solar flux index (Fs), and the Central England Temperature (CET) dataset (the longest instrumental record in the world, 1650 to present). They demonstrate that cold winters tend to occur at times of low solar activity, suggesting that this is due to blocking events. They find however that "any solar control is subtle and far from being the only factor causing variability", noting that during the Maunder Minimum CET temperatures exhibited almost the full range of variability. In addition to Barriopedro et al and Lockwood et al it's also worth checking out the Wheeler presentation slides linked to in the references below, that provides information about storms and wind direction changes during the Maunder Minimum, supporting the idea that winter blocking highs were more prevalent in Western Europe. As a late addition, from Lazarus in comments on the previous post: Ineson et al, Solar Forcing of winter climate variability in the Northern Hemisphere. Only available from Nature at present, here, I'll link when it 'leaks' out from behind the paywall. It's a model study showing that when forced with UV changes as observed by satellite the model responds to low UV in the solar minimum with a low index AO state. This is the sort of relationship expected as low index AO events during winter favour the development of blocking highs in Northwestern Europe. One issue I have with the idea of reduced UV causing stratospheric cooling as an iniator of colder winters is that there has already been a trend of cooling due to CFCs (lower stratosphere) and CO2 (mid/upper stratosphere and above). Yet we haven't seen a commensurate trend towards colder winters. Lockwood et al mention the possibility of changes in cosmic ray flux impacting clouds, there may also be other factors that mean the anthropogenic upper atmosphere cooling is not directly comparable with the impacts of reduced UV irradiance. I've previously posted on an apparent impact on Northern Hemisphere circulation following 2005, one that has no precedent since 1948 (the year NCEP/NCAR reanalysis begins). Is this recent pattern due to low UV levels and not, as I suggest, due to reduced Arctic sea ice cover? 1963 was notable as an extremely cold winter at a time of low Fs, mentioned by Lockwood et al as seeming to be associated with the low Fs. Yet neither the 3 year period around 1963, nor the individual years show the recent summer pattern. So I'd suggest low UV levels do not play a role in the recent summer Arctic pattern. (I'd like to have more years but NCEP/NCAR only goes back to 1948 and only the minimum in Fs around 1963 compares with the current low). There is very good reason to expect that a reduction in solar activity will increase the incidence of cold winters in the Northern Hemisphere, particularly north west Europe. With the solar minimum we've just gone through having been unusually inactive, and predictions of reduced solar activity to come, it is not unreasonable to suppose that we will see an increase in cold winters. However as I will show in the following posts there are two other lines of reasoning that suggest we should expect more cold winters. Baldwin & Dunkerton, 2003, "The Solar Cycle and Stratosphere-Troposphere Dynamical Coupling." Barriopedro, 2008, "Solar modulation of Northern Hemisphere winter blocking." Shindell et al, 2001, "Solar Forcing of Regional Climate Change During the Maunder Minimum." Wheeler presentation - Naval records and climatic changes in the Maunder Minimum.